What is a misprint disc? Misprints are perfectly manufactured discs with cosmetic flaws in the printing. They fly just as they're supposed to, but don't look as good as they should. A misprint typically has one of two problems: the foil used to stamp the artwork onto the disc is flawed, or we goofed and used the wrong artwork. When either occurs, we don't expect the customer to pay for it; instead, it goes onto a shelf with other misprints. When we get too many, they are offered for sale to the public at very low prices. 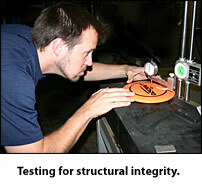 There are two quality control stations at Discraft: Structural and Cosmetic. Since a structural flaw can cause flight inconsistencies, we won't knowingly sell discs with structural problems... ever. If someone ever claims to offer you "Discraft X-outs," they are either incorrectly describing misprints or are trying to sell you counterfeits. The second quality control station is after the artwork stamping process. If the art stamp has a problem, that disc becomes a misprint. It will still fly perfectly, but who wants to pay full price for flaking or scratched up artwork? Once it is stamped, we can't regrind the plastic because we don't want the impurities in the stamp to be mixed inside of your next disc. So instead we offer them to you at super low prices. Where can I buy misprints? Since the appearance of these discs is less than perfect, we don't allow them to be resold by retailers. Instead, misprints are offered directly to consumers exclusively through our partner site at the Discraft Factory Store. 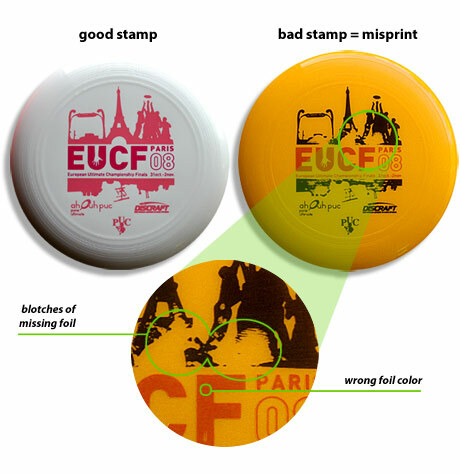 You'll find a variety of misprint packages for every disc sport.